Charlton Horethorne is an active parish set amidst the beautiful countryside of South Somerset, close to the county border with Dorset. The parish comprises the village of Charlton Horethorne, the nearby hamlet of Stowell, a cluster of houses at Sigwells and some outlying properties. The population in 2011 was 591. 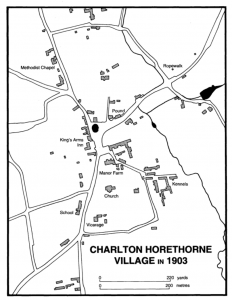 In Charlton Horethorne village itself, two key parish assets stand within 50 metres of the Village Green. The Village Shop sells gourmet and everyday foods, newspapers and a wide selection of items and is an important meeting point for villagers. The King’s Arms Country Pub and Restaurant, with its 10 modern bedrooms and excellent restaurant, draws customers from far and near. Not visible, but nevertheless instrumental to the local economy, is a mix of small businesses, many operating from the proprietors’ homes. Looking east from the Village Green, the Village Hall can be seen. This former First World War army hut provides up to date facilities for the Village Pantomime Society, Youth Theatre, and adult drama group, and is the weekly venue for two short mat bowls groups, the Fine Folk country dancing group and the Art and Crafts group, and the monthly venue for the “Second Thursday” over 60s group. The Hall is also used for public meetings, as a polling station, for the annual flower, produce and craft show and for parties and celebrations of all kinds. A short walk from the Village Hall is the Millennium Green, opened in 2000 as a recreational area for villagers and visitors alike. It has a small children’s playground, a wildlife pond and on 5 November hosts the very popular annual bonfire and firework display. South from the Village Green stands the Church of St Peter and St Paul dating back over 900 years. In addition to regular Sunday services, the very popular “Give a Mum a Break” coffee mornings take place in the Church and enable young mums to meet together whilst their children are cared for. The Church also has an enthusiastic bell ringing team. The lovely church of St Mary Magdalene (built 1834) is both church and social centre in Stowell. Charlton Horethorne Primary School plays an important role in the lives of our younger citizens and has an active PTA which organises fund raising events open to all. The surrounding countryside is both ideal walking country (there is a walking group) and a place of work, with arable and livestock farming considerably supporting the local economy. With a thriving Croquet Club, a Wine Society, Gentlemen’s Luncheon Club (meeting monthly in the King’s Arms) and two ladies groups there is no need ever to be bored in the Parish of Charlton Horethorne. Parish Council Elections 2nd May 2019 – Get involved!